The horsefly is known under many different names in different countries, including deer flies, clags, gadflies or breeze flies. These flies are known for attacking animals including humans and biting them to feed on their blood. This can be dangerous because the horsefly can transmit parasites or diseases amongst its victims. Like mosquitos, female horseflies must ingest a protein based blood meal before they can reproduce. Some varieties of horseflies are very large in size, while others more resemble the average housefly. While these flies are typically seen as pests, they also serve a role as pollinators for flower. Pain. The area where you were bitten will be torn, and will become sore. Red lumps will typically develop around the area where the bite occurred as your body exhibits a histamine reaction. This may cause the bite to become inflamed or itchy as your body attempts to remove any infectious materials from the area. Allergic Reaction. Those who experience an allergic reaction to a horsefly bite may develop a body rash after being bitten. They may break out in hives or develop wheezing as the body continues to react to the infection. The skin may become pink or swollen. The area around the eyes and lips may begin to swell and the patient may become dizzy or weak. Infection. If the fly was carrying parasites or bacteria that cause an infection, the bite can become extremely painful. Pain may radiate from the area where you were bitten and you may notice pus oozing from the wound. This is a serious reaction that will need to be taken seriously to avoid further medical complications. The bites may take longer time to heal than other insect bites which generally take two to three days. Here are some helpful tips to fasten the healing. Use saliva. Once you realize you have been bitten, cover the wound with saliva. The saliva is filled with Histatin protein that contains healing properties which will allow you to limit the negative effects of the bite and protect it until you can get indoors and treat it properly. Clean the wound. Mild bites by horsefly will usually heal in a few days without medical intervention. Simply clean the wound with soap and water and pat it dry to protect the wound from becoming infected. You may also use an antiseptic to clean and sterilize the wound. Avoid scratching the bite when it begins to itch. This will prolong the healing time and increase the risk that you will get infectious materials on your hands that you could spread to others. A hot compress can also provide relief. Soak a clean towel such as a tea towel in hot salt water and apply this to the wound. Take care not to scald the infected skin or apply too much pressure to the damaged area as this could increase your discomfort. Different remedies. 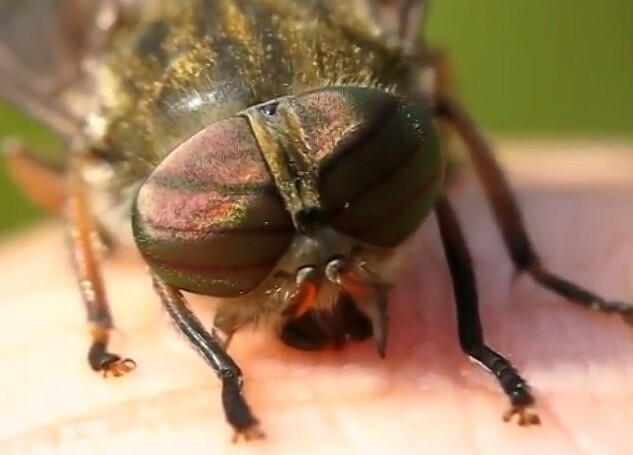 Many cultures have developed remedies to assist with the pain of a horsefly bite. Icing the wound will help reduce swelling and dull the pain associated with a bite. You can also apply aloe vera, vinegar, Epsom salt, raw onion, mud, honey, a paste made from baking soda or vinegar to the bite to help reduce swelling and discomfort. Once you have applied a topical agent to provide relief, cover the area with a loose bandage to protect the wound and to help keep the remedy in place. Apply Drugs. If the bite is particularly itchy or swollen, apply Benadryl or hydrocortisone cream to the area to help eliminate these symptoms. Oral antihistamines can also be taken to help avoid an allergic reaction. See a doctor. If you begin to suffer an allergic reaction, the bite is very painful or the bite appears to be infected seek medical attention immediately. Bites by horsefly can cause severe reactions which can be life threatening if the histamine reaction is very severe. They can also contain bacteria or parasites that can cause a dangerous infection throughout the body. Your doctor will evaluate your symptoms and provide the necessary course of treatment to eliminate these symptoms. Traps can be purchased and placed in areas that are known to have swarms of horseflies. This will allow you to catch the flies so they cannot do damage to you or your animals. If you know that you will be working in an area that has horseflies flying about, wear long sleeves and pants to protect your skin. This will not eliminate the chance that you will suffer a bite by horsefly, but it will lessen the severity of the bites you receive. Most horseflies will avoid people who are using insect repellent. Spray a high quality insecticide on yourself or around the area where you will be working to ward off these insects. Using a repellent with diethyltoluamide or DEET is particularly effective in keeping horseflies at bay. Some also believe that taking garlic supplements will allow you to develop a natural odor that helps to ward off horseflies when you sweat. Does a Wasp Bite or Sting?